Note: This card is no longer open to new applications. Information listed here is accurate as of Apr. 10, 2018. 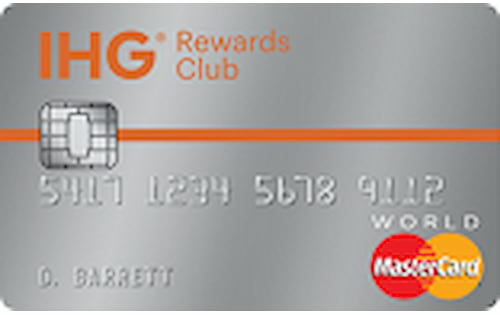 The Verdict: The IHG® Rewards Club Select Credit Card is perhaps the best hotel rewards card on the market, offering attractive benefits capable of satiating the appetites of IHG loyalists and people testing the hotel-affinity waters, at a price point neither group can quarrel with. In addition to earning 5 points per $1 spent at IHG hotels, 2 points per $1 at gas stations, department stores and restaurants, and 1 point per $1 everywhere else, cardholders receive complimentary Rewards Club Platinum Elite status and one free night each year. Spending at least $1,000 in the first three months your account is open also triggers a bona fide rewards windfall: 60,000 bonus points, redeemable for up to six free nights. All of that is yours for a $49 annual fee that’s waived for the first year. All things considered, the IHG Card is a tough deal to pass up, yielding roughly $1,300 in net rewards value over the first two years, based on the average person’s spending profile. That equates to about 11 free nights, on average, depending on when and where you stay. 60,000-Point Initial Bonus: This is a big bonus, even by hotel rewards card standards, and it’s even bigger when you consider that cardholders get 10% of their points refunded upon redemption. That, in effect, turns a 60,000-point bonus into a 66,000-point bonus. It’s possible to squeeze six free nights out of this bounty with some points to spare, as IHG’s website advertises redemption for as little as 10,000 points. But, on average, this 60,000-point score will yield roughly $498 in reservations – or about four free nights, based on IHG’s $121 average daily room rate. Either way you look at it, you’re getting compensated quite well for giving IHG a shot. Pledging fealty to a hotel chain is a decision you need to sleep on, after all. One Free Night Each Year: IHG gives cardholders an annual anniversary present in the form of a voucher redeemable for one free night in a standard room at a hotel in the IHG family. That more than makes up for the card’s $49 annual fee, especially since the terms and conditions don’t distinguish between IHG’s most luxurious and more ordinary properties. The only stipulation – aside from the voucher being applicable only to standard rooms – is that you must use it within 12 months of its issuance, though some reports indicate that redemption is possible beyond this point. Complimentary Platinum Elite Status: Platinum Elite members benefit from complimentary room upgrades, a 50% bonus on points earned for stays and a host of smaller perks. Considering that Platinum Elite status would otherwise cost nearly $5,000 per year to maintain, the IHG Card’s $49 membership fee starting in year two is a pittance. Solid Rewards Earning Rates: The IHG® Rewards Club Select Credit Card helps take your quest for free nights beyond the realm of reservations, providing 2 points per $1 spent at gas stations, grocery stores and restaurants to supplement its 5 points per $1 IHG earning rate. Those are major spending categories for most people, a fact that gives the IHG® Rewards Club Select Credit Card more mass appeal than your average hotel affinity card. And the ability to reap an additional 5 points per $1 spent on reservations and on-property purchases (on top of the 5 to 10 points you’ll get just for being a Rewards Club member) helps to cement this card’s position as a perfect IHG travel companion. Valuable Points For A Hotel Chain: Not all hotel points are created equal. They vary widely in value across chains and redemption methods, creating an environment in which you have to put everything in dollar terms to see exactly what you’re getting. For example, one hotel chain’s points might be worth a full cent each when redeemed for free nights, while another chain’s amount to half a penny. This helps put initial bonuses and earning rates for co-branded credit cards into context. Fortunately for IHG fans, IHG points are among the most valuable hotel points on the market – worth $0.0083, on average, when redeemed for free nights at the chain. Only A $49 Annual Fee & It’s Waived Year One: One year of free use is worth quite a lot, considering the IHG Card’s hefty initial bonus and the fact that its other perks make paying $49 in the out years seem like a no-brainer. In other words, this card is a bargain under normal pricing conditions, and the first-year fee waiver just puts more money back in your pocket. No Intro Financing Offer: While you shouldn’t leverage debt to pay for hotel reservations, the IHG Card’s rewards earning structure encourages spending in other categories as well. With that in mind, some folks will undoubtedly make it their only credit card and may therefore incur added costs as a result of the card’s lack of low introductory interest rates. If you have an existing balance that you want to transfer, or are planning a big-ticket purchase that will take a while to pay off, the IHG® Rewards Club Select Credit Card is not the tool to use. 1 Point Per $1 Base Earning Rate: One point, mile or penny per dollar spent is pretty much the industry-standard base earning rate for rewards cards. And it’s easy to assume that all of those rewards currencies are equal in value. But while some cards allow users to redeem points or miles at a 1:1 ratio for cash or cash equivalents, that is not the case with the IHG® Rewards Club Select Credit Card. Instead, you’ll reap only about three-quarters of a penny per dollar spent in all categories except IHG reservations, gas, groceries and dining out. You may therefore want to consider opening a supplementary card with more-flexible, lucrative rewards in spending categories that are underrepresented by the IHG Card. No Foreign Transaction Fee: It wouldn’t be right if the InterContinental Hotel Group’s credit card charged a fee for international use. So it’s good that it doesn’t. You’re free to travel the globe and sample IHG’s foreign locations without having to worry about being hit with the 2% to 4% international processing fee found on roughly 9 in 10 credit cards. This, in turn, enables you to benefit fully from the fact that MasterCard charges some of the most favorable currency conversion rates available to consumers. Above-Average APR: We know that paying your bill in full every month is essential with a rewards credit card because finance charges can quickly erode earnings, especially since rewards cards tend to have relatively high interest rates. That’s still true as far as the IHG Card is concerned, but not to the extent you might expect. The card’s 17.24% - 24.24% (V) APR is actually below the 20.31% average for credit cards for people with good credit. You still should strive to always pay your balance in full, but this card won’t gouge you to quite the same extent as many of its competitors. Initial Bonus Fluctuation: Credit card initial bonuses are promotional in nature. Put differently, they haven’t always been around and they aren’t guaranteed to stay. That’s true for bonuses in general and as they relate to individual cards. For instance, the IHG® Rewards Club Select Credit Card has offered in the past as many as 80,000 bonus points. That doesn’t mean you should wait to apply until IHG is feeling especially generous. Sixty thousand bonus points is still a heck of a deal, after all, and WalletHub research shows that bonuses have stabilized in value in recent months after steadily rising in the years following the Great Recession.